Each person or company to be direct billed must have a customer account. Go to Direct Bill > Customer Processing > Set up customers. 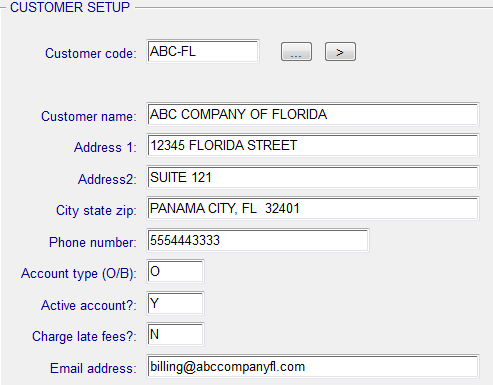 Your screen may have additional optional fields such as credit limit; these are discussed in Control Files Setup. Customer code: The customer may be up to ten characters, alphanumeric. This code will be entered when a DB payment type is entered in a reservation, group, or folio or when an A/R charge is selected in POS. NOTE: Do not use "ADDRESS" for the company code, as this is the code you will use to set up your property's name and address. Customer name: The customer name is what will display on lookup. Address 1: The address will print on customer statements. Address 2: The address will print on customer statements. City state zip: The city/state/zip will print on customer statements. Phone number: Enter the phone number, ten characters, in this format: 5554443333. Account type (O/B): Under most circumstances you should enter the letter O. This stands for Open Item. This requires payments by the customer to be applied to specific invoices. Statements will reflect open items, which include unpaid invoices, overpaid invoices, and partially paid invoices. B stands for Balance Forward where customer payments pay off the balance without being applied to specific invoices. Once you have set up a customer as O or B, you cannot change this setting once any transaction has posted. Active account? : Y will allow users to look up this account. N will not display this account at lookup. Some reports have the option to print or not print inactive accounts. Charge late fees? : Answer Y if you would like late fees charged through "Post late fees". This must be set up in advance in order to process properly. Email address: Enter the email address to which to send statements. Enter ADDRESS in the "Customer Code" field. Then enter your hotel or property name, address, etc. The account type bill be O, as this is a required field.